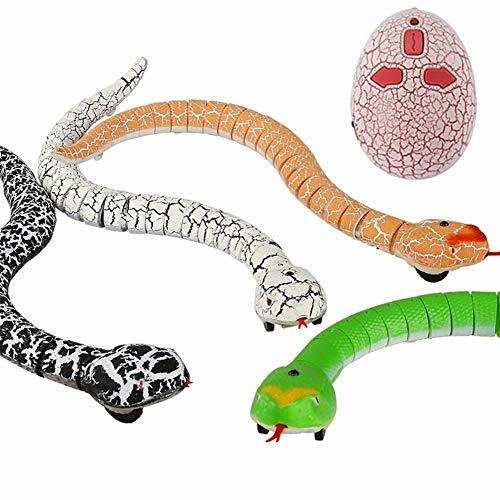 If you’re interested in remote control snake toys for your son or daughter, there are a number of surprising benefits that they can experience while playing with them. Furthermore, these toys have easy-to-use remotes and remarkably realistic movements which can keep kids entertained for hours. So, we’ve researched and reviewed what the best RC snake toys have to offer so that you can be sure to find the one that you think your little one would enjoy playing with the most. A buyers guide section is also available at the end to provide you with even more useful information to help you feel awesome about a final decision! 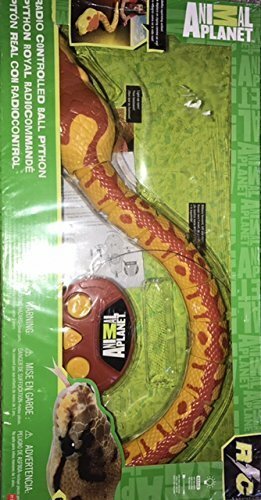 This Animal Planet Ball Python comes with a remote that allows kids to control the snake to move in different directions. Using the remote is a fantastic way for your child to develop their hand-eye coordination and motor skills. We liked how the snake toy comes with light up eyes as it makes it more exciting to play with. Not to mention, it’s also an effective way to improve your child’s visual learning senses. In addition to this, the design and slithering movements are incredibly realistic. As a result, kids are able to play with the toy in more creative ways. Parents have also been liking how the USB cable provided makes charging super convenient. We were impressed with how they’ve designed this snake toy to look and move like a real snake. It’s more fun for kids to play with and stimulates their creative side. This one comes in a dark blue color that kids have been loving. With 3 different frequencies available with the remote, you can always be sure to find a channel that doesn’t have any interference for responsive controls. Kids can use the remote to make the rattlesnake toy move with speed and in different directions. Your little one’s motor skills and hand-eye coordination are able to develop well while using the remote. Furthermore, by seeing the realistic movements, kids have more fun playing with it for longer. The snake’s tail can move around and its tongue is retractable, which add to the realistic features and make for a more exciting playing experience. As a result, kids feel encouraged to use it to play in more imaginative ways. With such responsive controls and realistic movements, kids can have a blast playing creatively with this snake toy for hours on end. 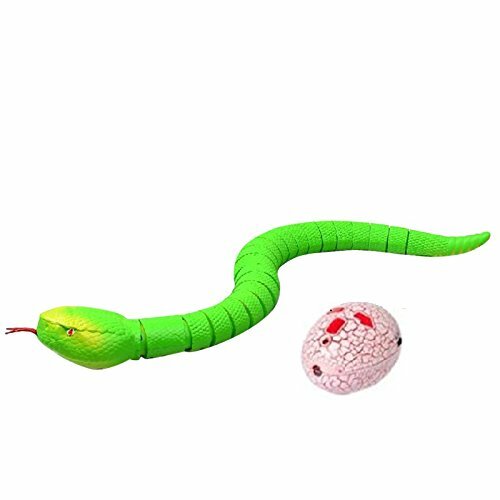 Liberty Imports’ RC Snake Toy has been made with a segmented body design which enables it to slither along the floor with a realistic snake movement. In addition to this, it has a retractable tongue and a tail that can swing. These are all fantastic realistic features that keep kids entertained for hours and ensure that they’re able to play with a lot of creativity. We also liked how the remote that’s included has 3 frequencies that prevent interference. Therefore, kids can use it to control the toy with a lot of precision. Parents have been liking how the USB cable that’s provided makes the snake toy super easy to charge. 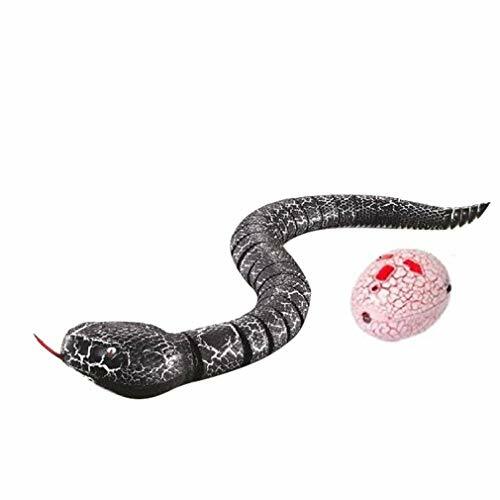 Due to the realistic movements available, children have fun using the remote to control this snake toy to play with plenty of creativity. The striped design that’s available with this one is something that children have been appreciating. 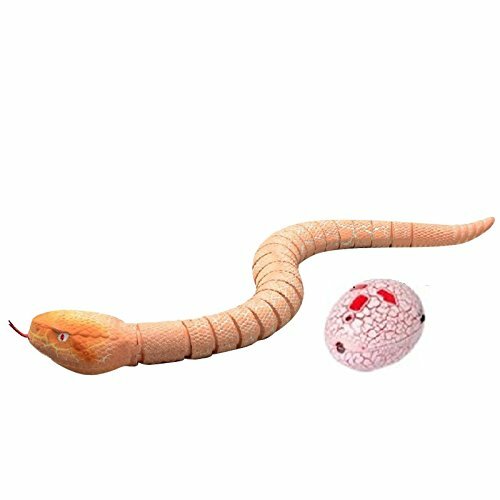 There’s also a swinging tail and retractable tongue make this RC snake toy an absolute blast for younger children to play with for hours on end. As a result of the realistic features, the toy feels more real, which encourages kids to play with more creativity. We also liked how the remote that’s included has been designed to look like a snake egg. It’s super easy to use and helps your little one to develop their motor skills and hand-eye coordination. The segmented body design allows the toy to slither along the floor just like a real snake does. Moreover, the remote has 3 frequencies that allow children to avoid any interference and control the toy accurately. The realistic movement features and responsive controls mean that kids can have fun playing with this one for a long time. It inspires them to play with more imagination too. With 22 different segments available, this Givem RC Snake Toy is able to move across the floor like a real snake does. In addition to this, it comes with a swinging tail and retractable tongue. These are awesome realistic features that help kids to use the toy to play with plenty of imagination for hours on end – which is great for their creative thinking skills. The snake also has a fast pace to it, which is more exciting to play with. We also liked how the remote has been designed to look like a snake egg and is easy to use. Your little one is able to develop their motor skills and hand-eye coordination while using the remote too. Kids have been having a blast with this toy as it moves like a real snake and lets them play creatively for hours. 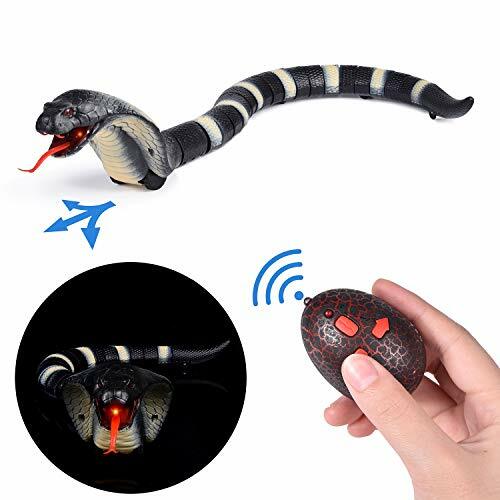 This Giveme RC Snake Toy is the same as the one above but it’s available in a different color that’s not as vibrant. It comes with a USB cable that makes charging super convenient. It takes 40 minutes to fully charge, which provides your child with 15 minutes of continuous play. They’re able to use the remote to control the toy to move around on the floor. As a result of its segmented design, the toy is able to slither around with the movements of a real snake. Furthermore, there is a retractable tongue and swinging tail available. These realistic features make the toy a lot of fun for kids to be entertained by for hours. While using the remote, you can expect your little one’s motor skills and hand-eye coordination to develop well. The segmented body design ensures that this snake can slither with realistic movements, which makes it a lot more engaging for children to play with. The Topsellser RC Snake Toy comes with an awesome scaled design on the snake and the remote. This remote allows kids to easily control the toy to move in any direction they like. This remote is super easy to use and helps to develop your child’s motor skills and hand-eye coordination. We also liked how the toy can move quickly and comes with a retractable tongue, as well as a tail that swings. These are exciting realistic features that little kids have been loving. It enables them to play with a lot of creativity. Charging this toy is also a breeze. It comes with a USB cable and takes around 40 minutes to fully charge, which provides children with over 15 minutes of continuous play time. This is a fun option that moves just like a real snake and enables kids to have total control over how they want to play with it. The charging process is also super easy! 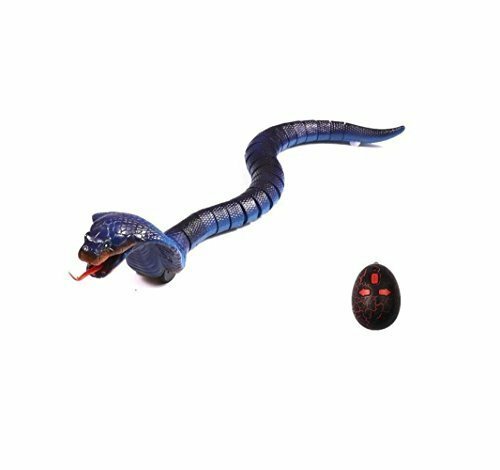 While reading through the different remote control snake toys above, you will find that you have a better understanding of what these kinds of toys have to offer. As a result, you can start to focus on the ones that you think your little one would enjoy the most. Having said that, if you’re not completely certain on which ones to go with, don’t worry. We’ve put together this buyers guide section to provide you with additional information that will be useful when it comes to the buying process. You will have noticed that there are a pretty small number of robot snake toys available bu if you’re having a tough time being able to easily distinguish between the various types, this section is for you. If one of these doesn’t suit your son or daughter you may want to check out some rc dinosaur toys or even rc dog toys as their both great options for little kids. We have included a rattle snake toys in this review because these types have awesome designs that kids have been loving. They’re able to use the remote to control the snake toy to move in different directions, and with a lot of speed. We were impressed with the Kingcobra snake toys that are available because many of them have a segmented body design. This means that kids are able to watch it move across the floor just like a real snake, which can be super entertaining. Pythons are another popular type of remote snake toy that children have been having a blast with. The one that we’ve included in this review has an incredibly realistic design that helps kids to use it to play with a lot of imagination. Water snakes have earned this title due to how they like to spend a lot of their time in the water. When it comes to water snake RC toys, you’ll find it difficult trying to find one online as companies haven’t started making them. Initially, you may not realize just how beneficial these robot toys can be for your little one. If you’re interested to learn more about how your child can experience some fantastic benefits while having fun and playing with RC snake toys, take a look below. While children are playing with these RC snakes, it’s likely that their interest in these reptiles will peak, if it hasn’t already beforehand. As a result, it encourages children to want to learn more about snakes, which is highly educational. If they start to ask questions about snakes while they’re playing, you can take it as a good sign that they have a keen interest. A lot of the options in this review come with incredibly realistic designs. As a result, it inspires your little on to use it to play in more imaginative ways, which is awesome for their creative thinking skills. One of the most entertaining ways that kids play is by carrying out remote control snake pranks! Kids have an absolute blast using the remote to control the toy to sneak up on people and it keeps them entertained for a long time. So, that wraps up our review on the best battery operated snake toys that are currently available. Be sure to consider the main features, pros, cons, age recommendations, and what makes each toy stand out. Hopefully, all of the information that you need to feel confident about a final buying decision can be found in this post!